A cheap Korean Harley Benton SC450 vintage guitar. Bought to upgrade. But was this guitar really any good? And how to upgrade it to a better guitar? Check this review to find out. You know how these things are, all of a sudden the market is flooded with very low cost Far Eastern guitars - some legal and some counterfeit. They always look very tempting to buy, after all the cost is so low for westerners its hardly a few Starbucks right? But can we really expect to get something really good for very little money? So that line of thought got me thinking about going to buy a SC450 and 'updating' it to be the best guitar that it could be. Anyone not familiar with the SC-450... well it looks rather familiar in shape and composition. 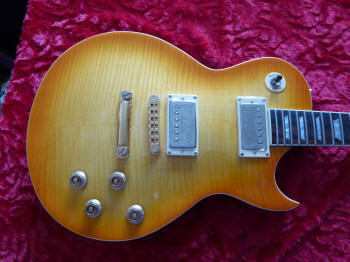 Far be it for me to call it a 'Les Paul', but I suspect that from 20 feet on a stage you certainly could. 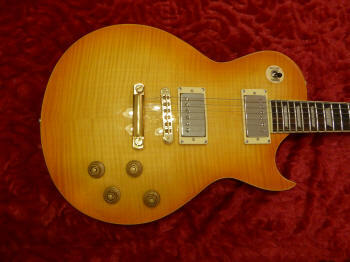 So maybe it might stand the test of being pretty much the same as a 'Les Paul' type even using some Gibson parts. They all look as if they fit from the images on sellers sites. What a great idea... buy the guitar for £125 ($170) and upgrade it with a maximum budget of say £450-£500 ($500-$750) and maybe I would have a 'Les Paul' for that low budget. So I located a guitar at Thomann and had to wait if I ordered one (they said) because it had 'sold out'. The specifications looked pretty good... Wilkinson pickups, vintage style tuners, bound body, mahogany body, but most of all a AAA maple top. Now that aspect puzzled me a little. You see, AAA grade maple costs money and the image I saw on the site looked like very nicely flamed maple. And Thomann offered the guitar with their 'famous' three year warranty. What did I have to lose! Thomann I have bought off historically a lot of equipment and had only ever sent back just one set of headphones because they were 'dirty'. Thomann also said that the guitar would come 'set up and checked' which for the money I wondered how they could do it all. So I ordered one. Harley Benton SC-450Plus LD Vintage Series, electric guitar, mahogany body with arched & flamed AAA-maple top, set mahogany C-shape neck, rosewood fret board, fret board radius 350mm, crown inlays, cream body & neck bindings, 22 frets, 628mm scale, 43mm nut width, double action truss rod, 2x Wilkinson MWCHB alnico vintage-style hum bucker pickups, controls: 2 x volume, 2 x tone, 3-way toggle pickup selector switch, DLX chrome hardware, DLX tune-o-matic bridge, DLX Kluson-style tuners, Daddario EXL 010-046 strings, finish: high-gloss lemon drop. So while I waited for the guitar I compiled a list of things I just wanted to upgrade so I knew there would be absolutely no issues - and that I could show guys how to do those upgrades themselves. 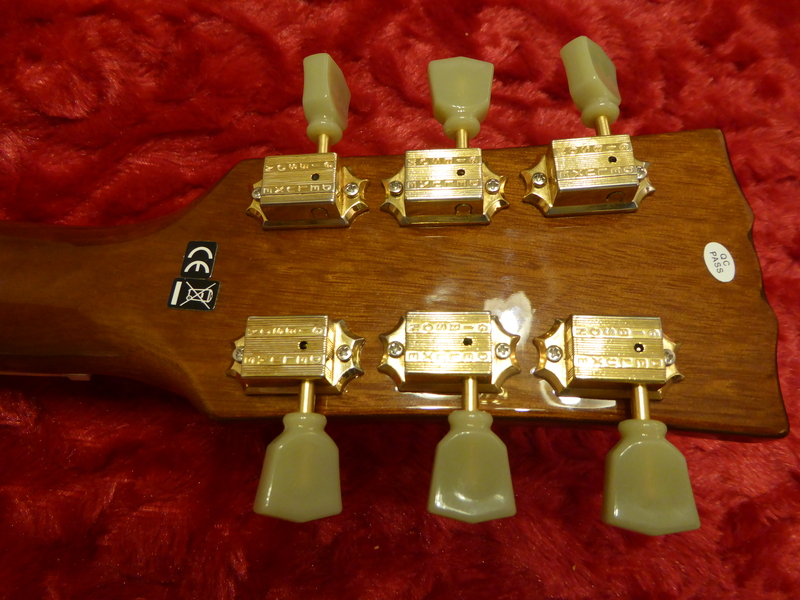 I decided that the tuners might be OK so did not buy those at the time. I did not want to go over budget because the idea was to not cut corners but to fit the best parts I could at a reasonable price. The most expensive part were the pickups followed by the bridge then the stop/tailpiece... but I had the Gibson parts already. However, I included the costs in my budget available. The guitar arrived a week or so later after they said it would ship and removing it from its box it looked great so I did not spend long on it, but went to play it in the studio outside. Tuning was rather difficult as the guitar drifted a little. It must be those new strings. After playing the guitar for a good thirty minutes and after stretching the strings extensively there was no way the guitar would stay in tune. Also the tone was a very thin sounding not so nice sound. It tried a few different amps but it remained about the same throughout. I filmed the guitar for my records and then gave up. So I decided to carry out the upgrades to the guitar and assumed that the parts were the problem. 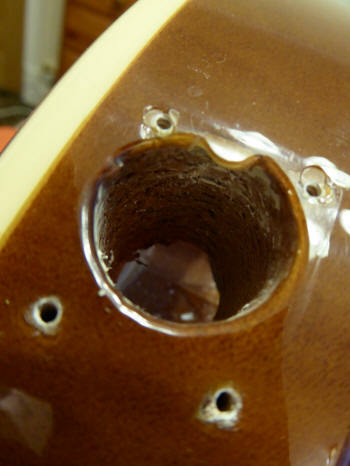 They were partly to blame, but there was a really bad issue with this guitar as supplied that to be honest I could not believe I was seeing as I stripped off the old parts. Above is what I found as soon as I removed the bridge. 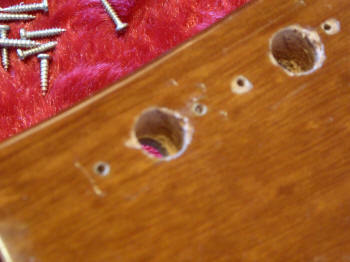 The bridge mounting holes had at least a 3-5mm hole wider than it should have been. The best way to see this is on the video at the bottom of the page. In fact the bridge mounts not only slid in and out they literally dropped in and swayed back and forth. I had found the reason for the detuning! This problem now caused me to be in a dilemma. In any case I decided that because I bought this guitar to upgrade it made little difference if I had to do a fix on the guitar at the same time so faffing about with returns did not matter in my case... but would it matter if you had bought this guitar? 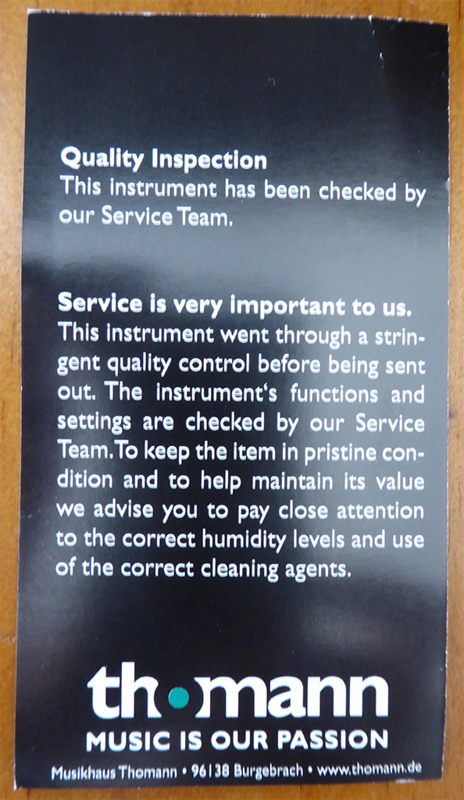 It also concerned me greatly because Thomann included a document (duly signed) showing that the guitar had been 'set up and checked' by their service team. Really! Either their service team were drunk at the time or they did not do the 'set up and check'. So I had immediately lost faith in their 'service team' right there and then. OK so I considered how to fix the guitar. I located some dowel wood from a store called 'B&Q' in the UK (a home improvement store) and made two plugs so that I could fill the holes. I made them fit snugly and wood glued them in place then waited a day. 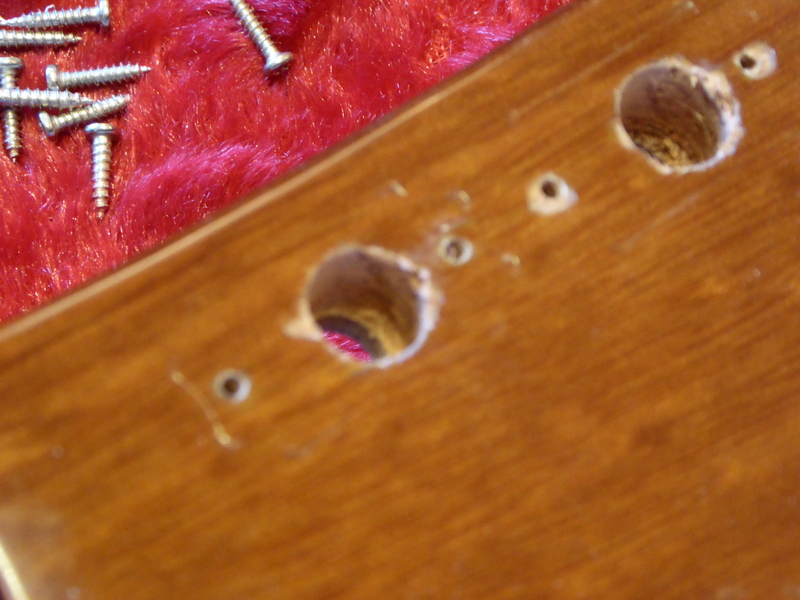 Later I re-drilled the holes smaller to accept a genuine Gibson bridge which fitted very tightly and resolved the problem of the bridge that was as shown in the above image. 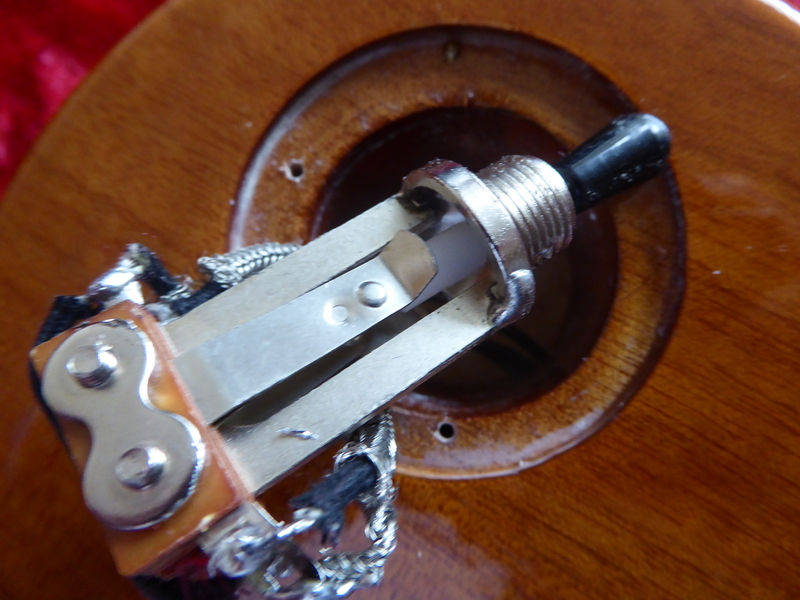 While I was at it, I also re-drilled the stop/tailpiece holes to take Gibson mounts (12mm give or take... be careful) and fitted that too. 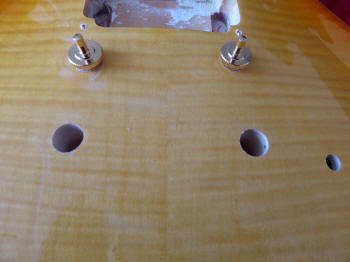 As you see from the above image the bridge components were fitted and the stop/tailpiece parts were ready to go. 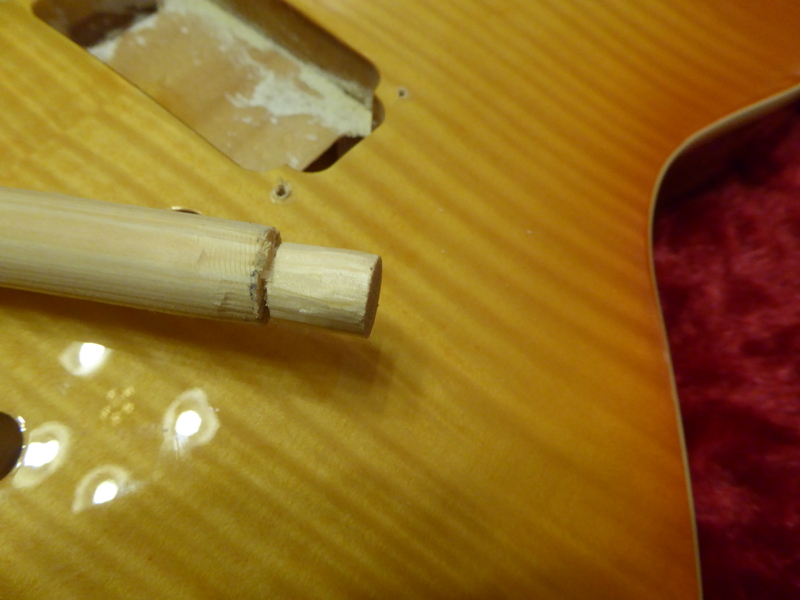 While I'm no luthier and I did manage to slightly dent the top of the guitar through tapping too far one of the dowels... so be careful if you upgrade your guitar. The fact is that this was a massive improvement over what appeared when I took the guitar out of the box originally and brand new. I really did not care much about aesthetics at this time, I just wanted to get the thing fully operational rather than throwing it in the rubbish bin. As you can see from that photo the repair and upgrade were all cool. 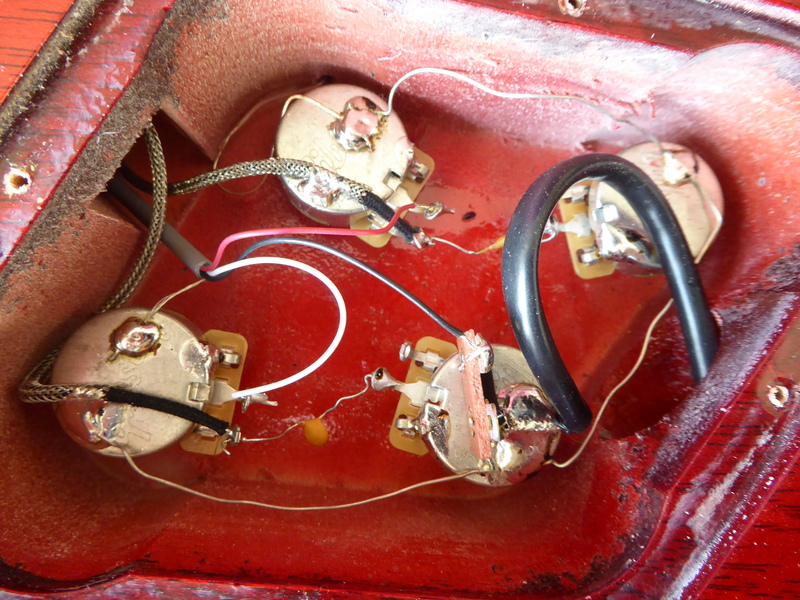 Hmmm it seems like the electrics were of the 'budget' type... (and I don't use that word lightly) - small pots of no brand, wiring from the toggle switch basically a piece of telephone cable (think of the interference potential) and really cheap capacitors. At least the Wilkinson pickups looked like they had reasonably good cotton shielded cable with a metal braided screen. Good. But I was removing it all anyway to upgrade the lot. The guitar was a cheap guitar and I guess the wiring is like this throughout the guitars they sell. Improvement is just around the corner. 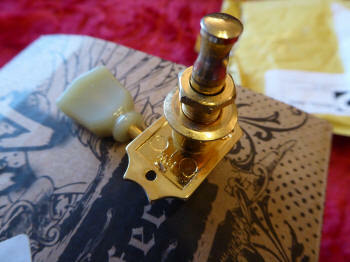 Next up was the toggle switch... I had decided to upgrade that from the start as they are often not good quality even on more pricier guitars. I bought a switch that the seller called 'original' Gibson on eBay. Let's cut the crap... it was another copy switch that had its poles in the wrong places and not a 'Switch craft' at all. Take note of this or you might well buy one of these that is a pain to make work. You can, but its far harder to do. Here's a shot of the so called 'new one' from eBay. Note the soldering on this was only for testing at that time. Make sure that when you buy one of these that it says 'Switch craft' stamped along it or you might get one of the above. It seems Switch craft have now made a shorter toggle switch as shown below which I later fitted. It was perfect and importantly, it stuck out of the front of the guitar exactly the right amount. The original was longer and so was the eBay one shown above. Get a switch craft! My wiring overall was completed easily enough. Once I had the better switch later it was nigh on perfect. 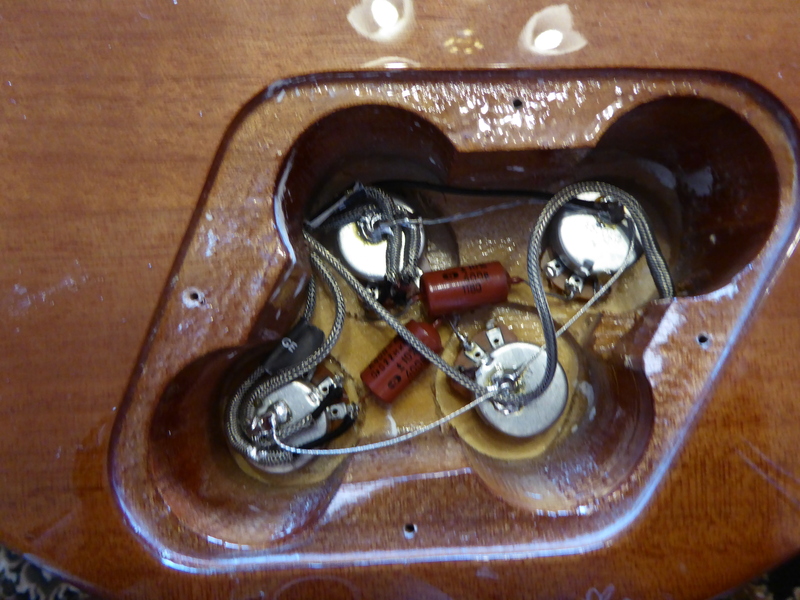 Just be sure that when you change out the stop/tailpiece or bridge mountings that you run a grounding wire from one of them in to the wiring cavity - it stops hum from external sources and acts as a 'least resistance' path for electricity if you ever touch a live microphone. There was one there originally fitted by the Harley Benton boys and I was happy to see that had been done on the original wiring. This picture is slightly blurry and there were a few more things to do before it was complete (ground the third leg on the pots for example, but you can see the larger pots, the wires from the toggle switch and the pickup wires - also that all important wire coming from the cavity connecting to the bridge. A big improvement. 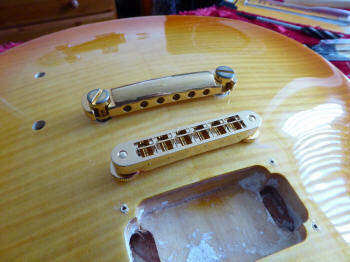 I did not use copper tape in these areas because I often find it makes very little difference to Les Paul type guitars. Notice the wood in the bottom of this cavity... it is supposed to be 'AAA maple' flamed as shown on the top of this guitar. In reality the wood grain goes across the body in a completely different way than the 'wood' on the 'maple' top. While it is possible it could be a form of maple... it is NOT from under here 'AAA maple' and never has been. Hmmm. Lets take a look at the top and that 'AAA maple'. Also notice that the cutout on the right of this picture did not allow the pot to face the way it would on similar guitars because the cutout is wrongly machined to do that - or the tone pot is drilled in the wrong place... make up your own mind. seemed a little confusing to me and might well be confusing to others. I'm used to seeing a proper maple top of figuring and not what I got here. Basically you take your money and you make your choice. After fitting the pickups in to the rings (which indeed were exactly the right sized rings for the Bare Knuckle Pickups - which in turn are the exact Gibson size too) I fitted them to the body and they were a nice fit with one exception. 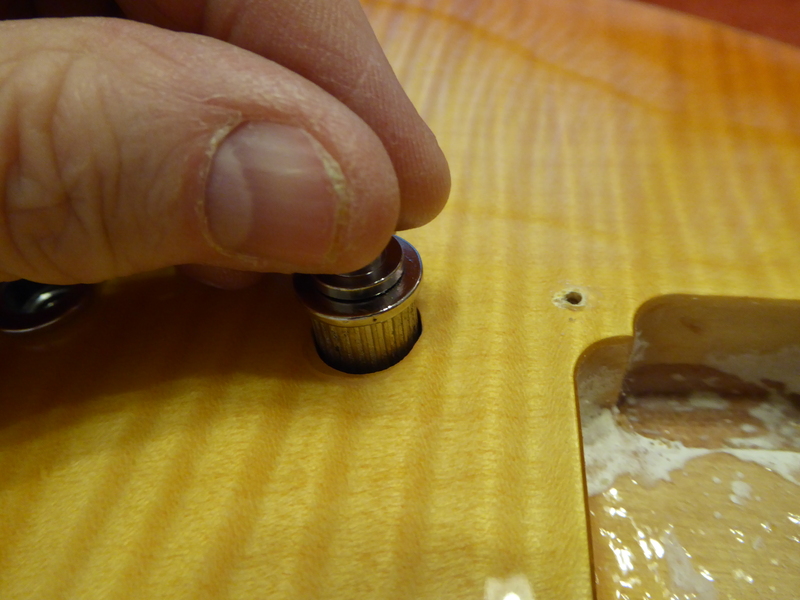 The routing for the pickups was not deep enough (slightly too shallow) for the pickup screws that fit through the pickups. I had to cut them down. The wood on the body is (it seems) specified as mahogany. 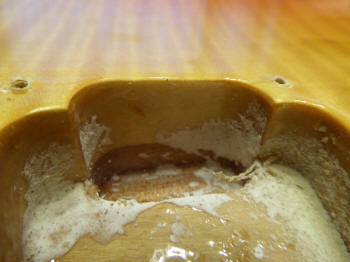 Close inspection of this wood where the guitar output cover fits shows its been drilled at high speed in my opinion. That's no real problem of course, but the finish is really course and not at all what I might have expected for mahogany. Still, I guess it could likely be mahogany but not as I have ever seen it. Maybe its a variety of mahogany that I have not come across which is quite possible as there are many types. I just wonder if this mahogany has the right make up to be light enough and resonant enough for a guitar. It might - or not? There is no way of knowing unless we identified the exact variance of mahogany used. Well at least it is mahogany right? And here is a shot of the guitar after the electrics are finished. Notice in the above image that the bridge has no 'grooves for the strings. On a Gibson bridge you have to make them yourself. I bought a 'cheap' set of files to do exactly that with the bridge being careful to place the grooves in the right place and of the right size. The original bridge as supplied had massive V grooves in it which I was not at all happy with. 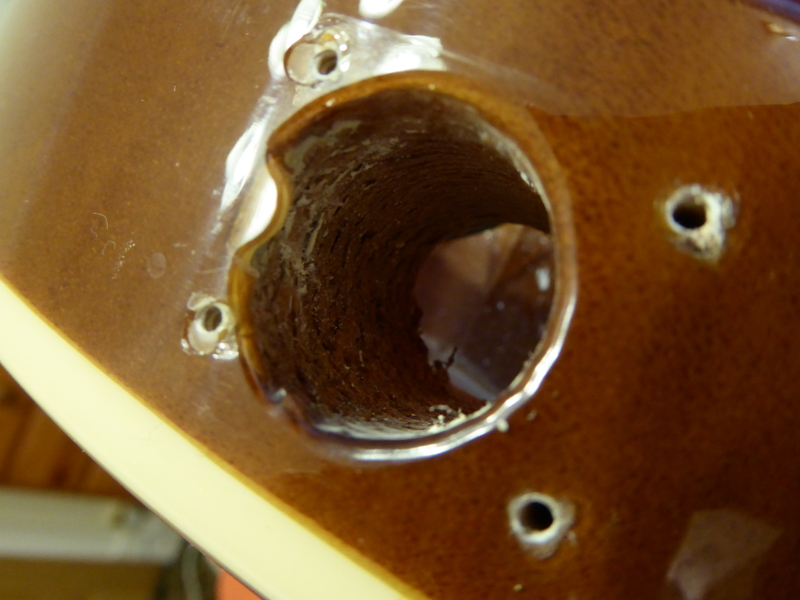 It also had the 6th string saddle just floating around because the mechanism to stop that was failed from new. There is zero comparison between the supplied bridge and the Gibson one - but even the lower cost bridges were better if not by much. Here's the guitar with strings completed. This Harley Benton SC-450 is now in a place it has never been before. 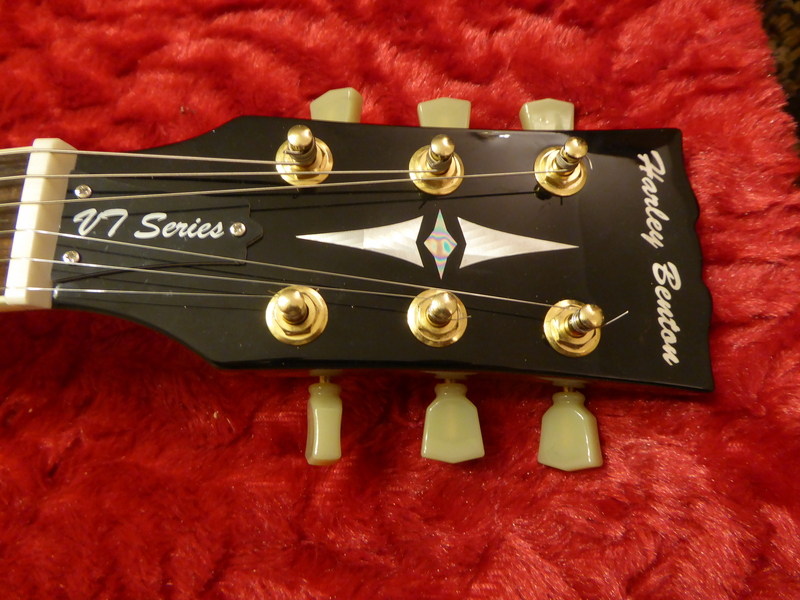 And if you have a Harley Benton guitar you could actually improve it for a lot less than the costs that I spent. There are cheaper parts and pickups available for sure which would enhance this guitar further than when you receive it from new of that there is no doubt. 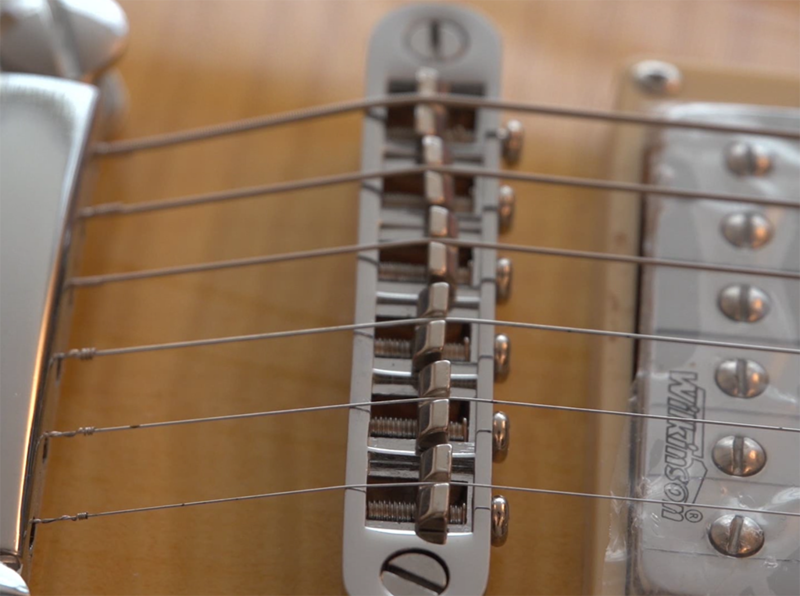 But I have never seen ANYONE actually fit genuine Gibson parts to this (or any other) type of very low cost guitar before and I did wonder whether it would make that much difference. In reality I had bought another 'Wilkinson' roller bridge but you know what it was not that much improved to make me fit it as the change for better things. 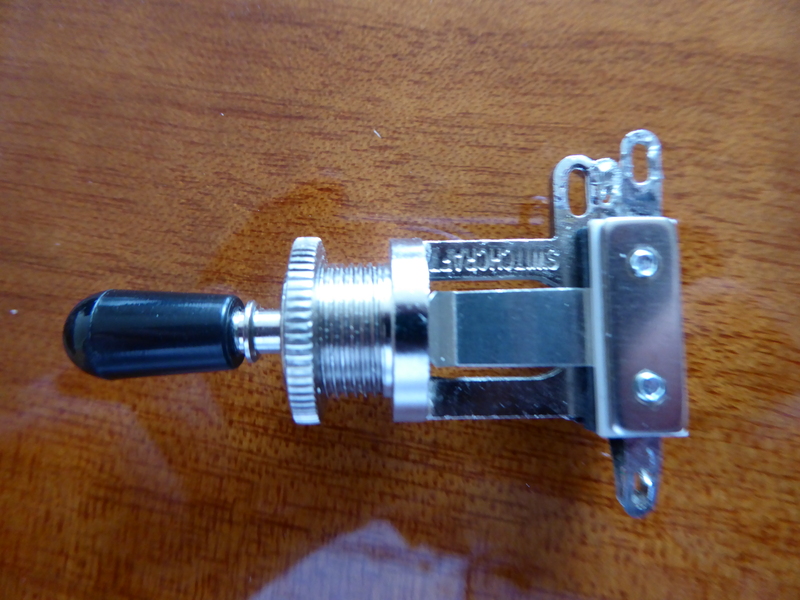 The tuners were left on this guitar as supplied for a while. For the most part they are adequate and do work - no problems there. But because I had upgraded the hell out of this guitar I bought a second hand set of Gibson tuners and fitted those. To do that you need to 'open up' the holes on the back of the headstock a little because the Gibson tuners are a screwed in front section that is accommodated on the tuner itself. 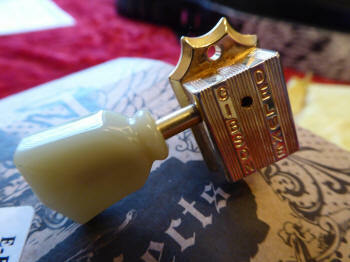 Here are the photos of the originals and the updated 'Gibson' tuners. And below are a set of tuners second user from a Gibson guitar that I picked up cheaply from eBay. 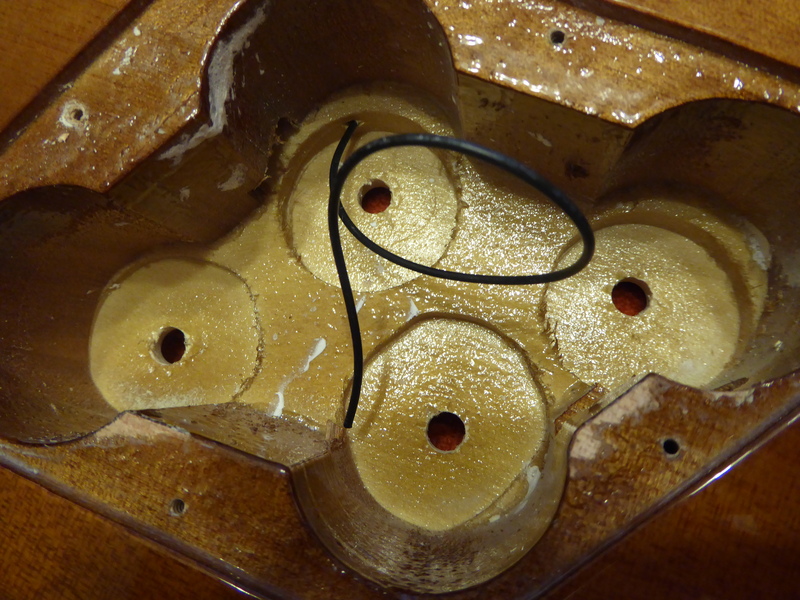 Notice that the holes for the new tuners were stepped and had been drilled out by me to accommodate the Gibson ones. 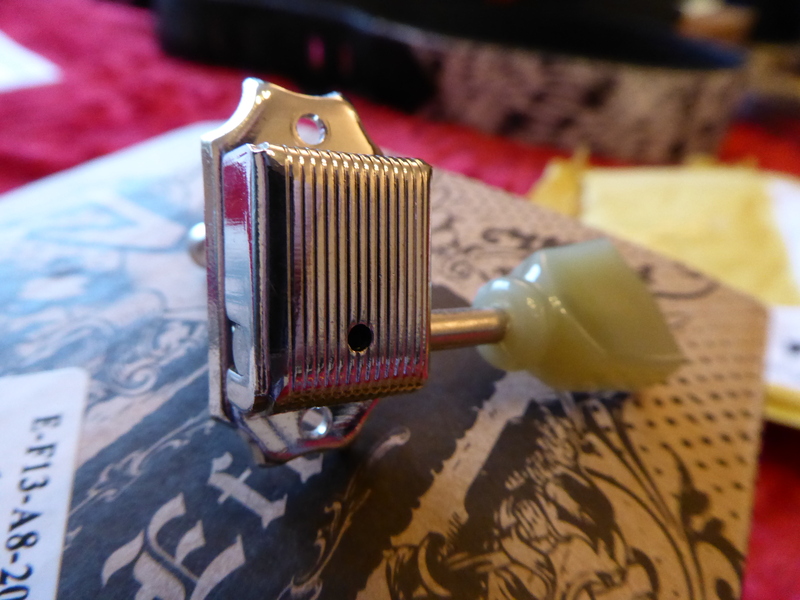 I used the original screws from the old tuners to fit the new tuners and by the way the screw holes needed no drilling they fitted exactly the same as on a Gibson Les Paul. Checking the Gibson tuners against the original Harley Benton units its pretty plain to see why Gibson tuners cost more. The HB ones are pressed steel and the Gibson ones are cast. 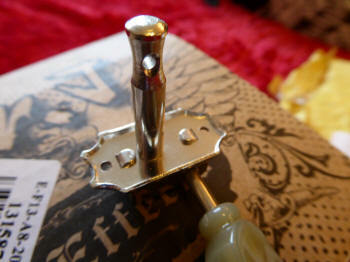 The front of the headstock is shown so you can see how the overall view of the headstock is different than stock. I do think that if you fit the best components that you can lay your hands on (even one at a time) then the result will actually be a bigger improvement overall to the final results too - remember I said it here. It was never really my intention on this upgrade review (or indeed the video upgrade review) to 'knock' this Harley Benton guitar. It has been very frustrating that I received this instrument in the way it was sent to me and not having the 'set up and check' that Thomann specifically stated and promised had been done ended up where I got this guitar and that is a pity. I may be right or may be wrong on the photo flame - it just might be veneer, but either of those two solutions are not what I understood to be an 'AAA maple top'. Most people that know a little about guitars know that description from either the likes of PRS or Gibson or some other quality brand and it is associated with at least 13mm maple tops... not a 1mm maple top. Having said all of that I bought this guitar to use as a vehicle to demonstrate how to upgrade it from some of the components that in my opinion are not that great - what did I expect for the money? Well I expected a solid guitar from the off that had been checked so I could simply and easily upgrade this guitar. There's no doubt it IS a cheap guitar and while it looks great over the internet or on video in reality there are basic issues on the one I received that clearly should have been resolved before they shipped the guitar... actually this one should have never even left the factory. Nobody cares... because if they did it would have never made it to me - actions do speak louder than words. But thankfully I DID overcome these problems on this guitar and it is an incredibly better and more focused guitar for it. If you are someone who can't really afford more than say something like a PRS SE or Epiphone (in this style maybe) then taking a Harley Benton and upgrading it might be an option for you especially if you are good with your hands like I tend to be. The finished instrument will stand up against other brands AFTER these upgrades and for a reasonable price too. For me, the guitar before the upgrades was not a viable purchase in any way. Always remember one thing... you are not going to improve the woods as supplied on this guitar... they are as supplied and will always be those woods no matter what. And there lies the choice... are you OK with a basic carcass of a guitar or do you want something better to improve. And the frets or neck angle and setting will remain as will that truss rod. Its your choice. While this guitar served its purpose of showing the upgrades for others I was not at all happy with the product when it arrived as it did. I don't care, I upgraded it, but others may not be able to do that and if they receive anything remotely like the guitar I guess you will be sending it back. So the score for the manufacturer on this guitar before the upgrades is ZERO! It should never have been sold. The score to Thomann for that non setup is also a ZERO because it was clearly never carried out. But they DID sign the declaration that it had been. No one could miss the problems on this guitar had they fitted the strings (that they also said was part of the set up and check) the bridge would have fallen off. However, after carrying out the upgrades and fixing the issues with this Harley Benton I would rate it at about a SEVEN. Its not all bad news. Of course I had to spend more money to make it all good and anyone who bought this particular guitar could have 'sent it back' or could do what I did. It all comes down to what is acceptable to you if you buy one. One thing is for sure, if I was not using this guitar to upgrade it would have been immediately returned with a letter indicating the position about that 'set up and check' to the seller and I would have insisted on that they collected it at their expense. I would have insisted on a full refund including all shipping on this guitar and never would have bought another one. Maybe I might not have bought anything from Thomann in the future - the fact is these days, if you live in the UK, there are cheaper places to buy right here in the UK. Thomann nil, other one. It's a sort of 'own goal' from Thomann on this sale to me. They should know better. Some people buy these Harley Benton guitars and tell everyone on the internet that they are 'perfect'. That might well be the case for their guitar and I don't suggest for one moment that all Harley Benton guitars are as bad as this one was sold and presented to me. But I have no way of knowing the returns rate and neither does anyone else except Thomann - and they are not telling. What I do question though, is that (for example) the bridge as fitted to this guitar was the 'standard' bridge supplied on at least this model, that the pots were again the 'standard' pots as supplied on at least this model, that the 'Wilkinson' pickups (if they really were that brand) are the 'standard' as supplied on this model. 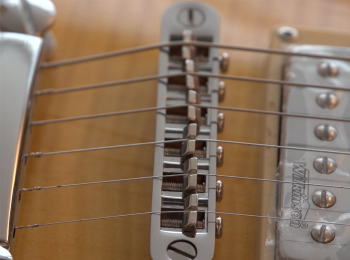 So why only this guitar with all these issues and all the others were 'perfect'? I think that comes down to what is acceptable to the buyer and user and whether they are always 'telling the truth' in the same way that I do. For me, I was and remain far more used to having a guitar that when I buy it new that every aspect of that guitar is thoroughly operational in a very good way. Clearly my 'standards' are not those of some other guys. Would I buy another Harley Benton guitar just to play without modifications? Unfortunately not - this guitar experience has gone some way in confirming that no matter what anyone says 'you always get what you pay for'. I also want to confirm however, that I would never buy a counterfeit Gibson guitar or indeed any of the bottom end 'kits' for guitars on the market today from varying Far Eastern manufacturers because in the main once again - it is pretty obvious what you will probably get. But you might be 'lucky'. If I wanted to gamble I might have better odds on the British premium bonds. Remember when you gamble no one promises you will win. This project seemed like a good idea at the time, simply buy a very low cost carcass, throw away the cheaper bits, upgrade the 'important' bits and hey presto a great guitar for not a lot of money. I'm happy with the result, but if I could choose a different route by maybe selecting a PRS SE or maybe some other higher quality guitar as that carcass to upgrade then I would take that route in retrospect. Less Hassle, better quality but it does cost more. I hope that this upgrade path as shown if you have a Harley Benton guitar and this review (if you don't) are useful to you. This review and upgrade path is now complete. Here's the video upgrade and review of the Harley Benton SC-450 Vintage with the Lemon Drop finish.